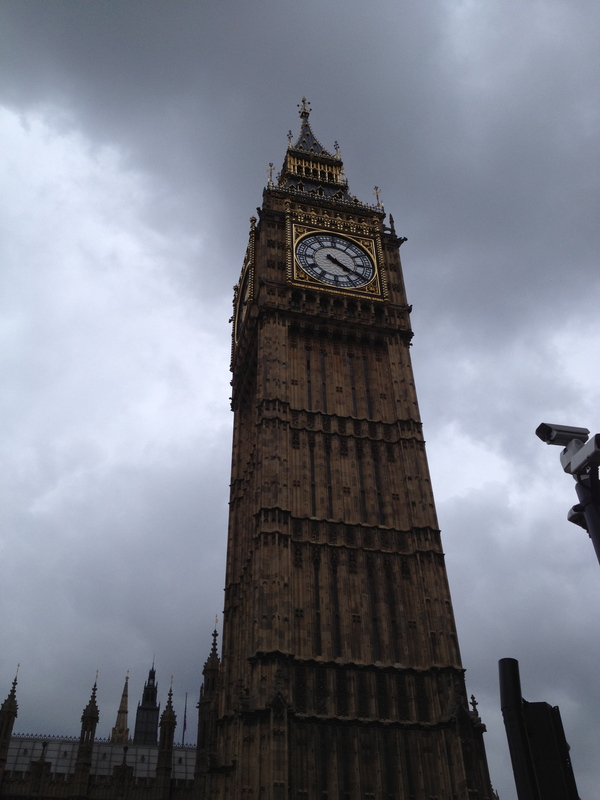 Day 5: Final Day in the UK, Manchester! 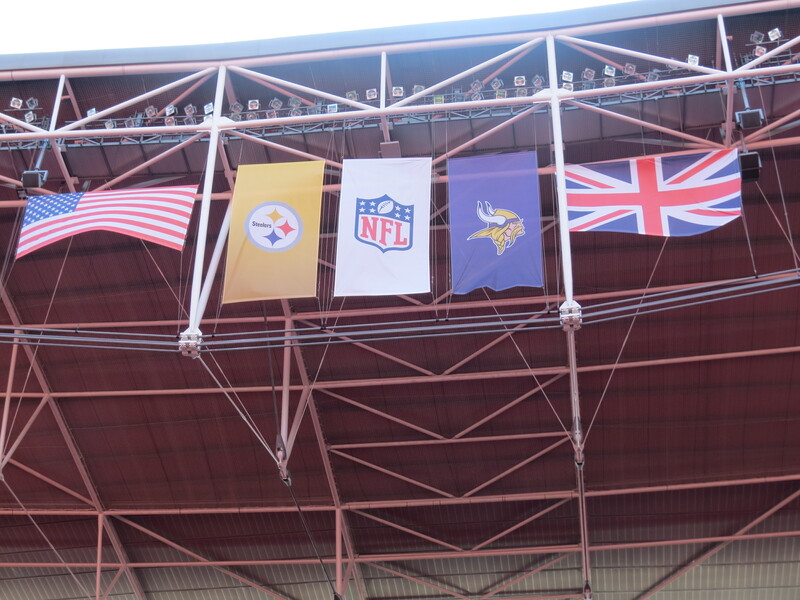 Day 5 in the UK was in the city of Manchester, home of 2 EPL powers. Mr. Simon Gumbrill was kind enough to return as the tour guide, thank you to him for the continued hospitality and kindness!! 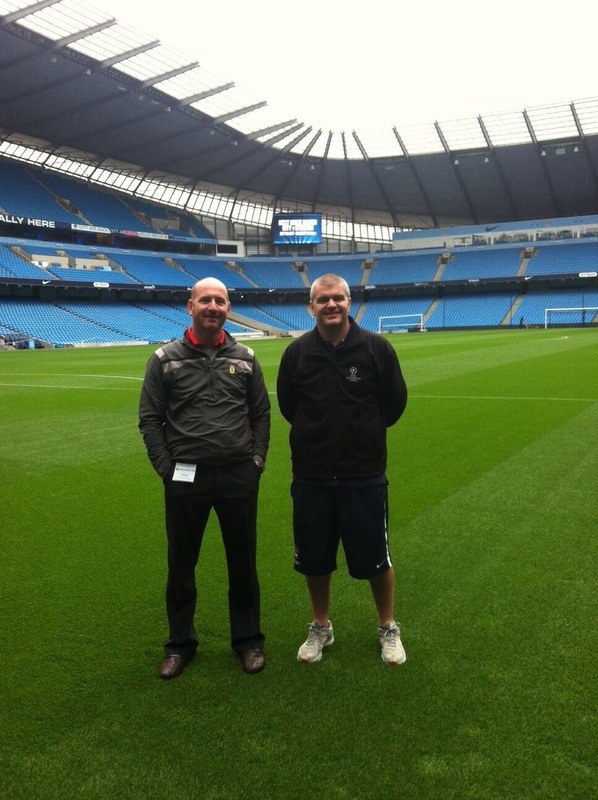 Our 1st stop of the day was to see Mr. Lee Jackson at Manchester City’s Etihad Stadium. Mr. Jackson, one of expert group member on pitch management for ESSMA, was gracious with his time and communication. Many thanks to Mr. Jackson for that. 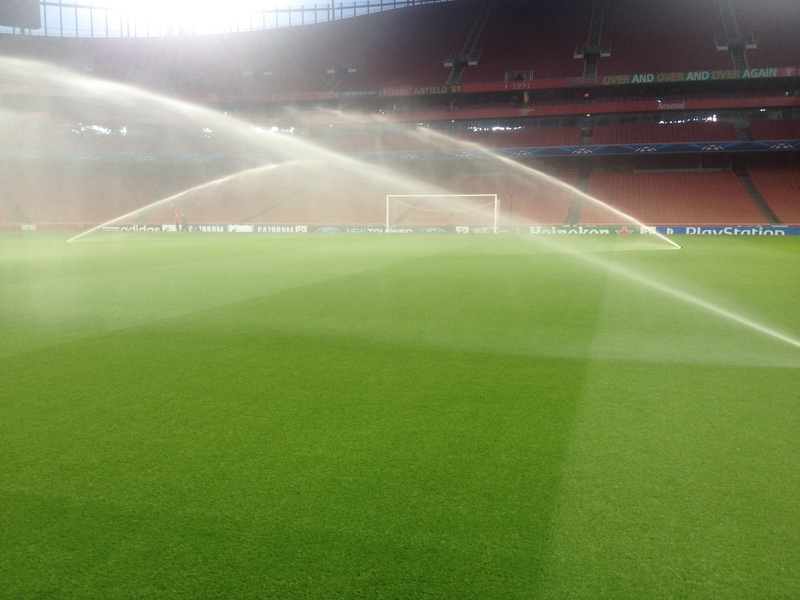 And even after a heavy stretch of use, the pitch was absolutely fantastic. Kudos to him and his staff for the hard work! 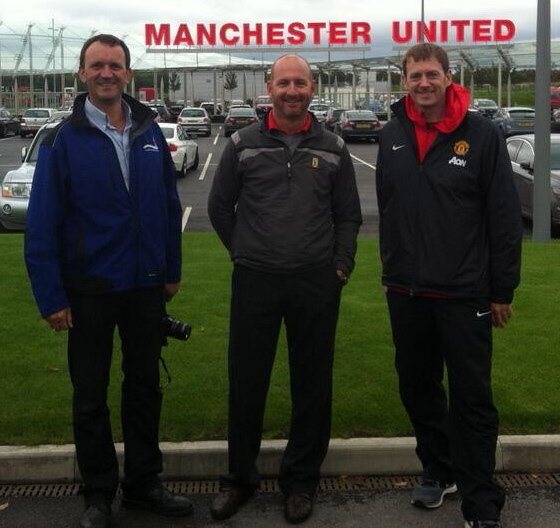 Leaving the Etihad, we traveled over to the training ground of the other team in Manchester, Manchester United. Great to see Mr. Joe Pemberton at his own facility after he dropped in to say hello on holiday when we were fraze mowing bermudagrass for the 1st time ever this spring at FC Dallas Park. 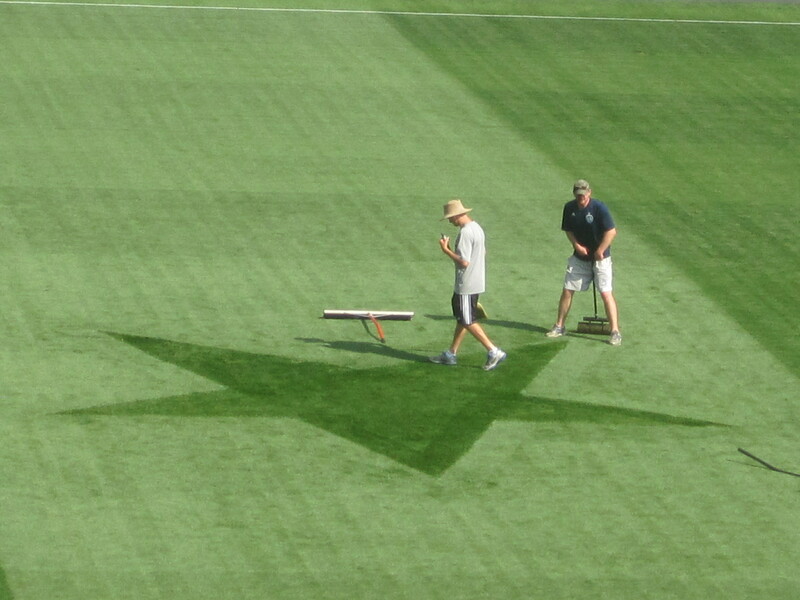 Mr. Pemberton and his staff have the ground looking fantastic. When we visited last spring, much of the facility was still under construction. Wow the results are impressive! 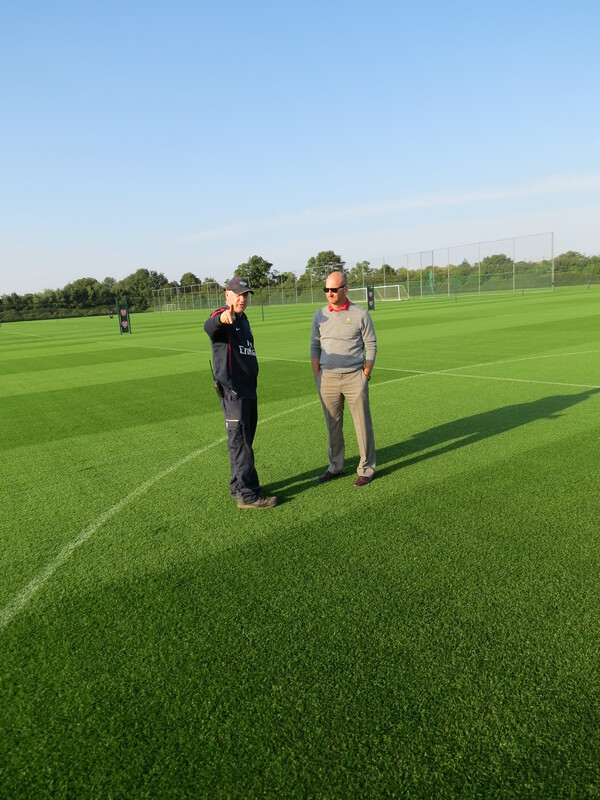 Thank you to Joe for taking the time to show us around and to share some of his thinking around large facility management and pitch maintenance. As the week in the UK closes, I can’t thank Simon Gumbrill enough for his time and guidance around the country. As I mentioned in a previous post, Simon’s personable nature and British charm is single-handedly drawing the worlds of US and UK groundsmanship together. THANK YOU Simon for putting up with my questions all week. 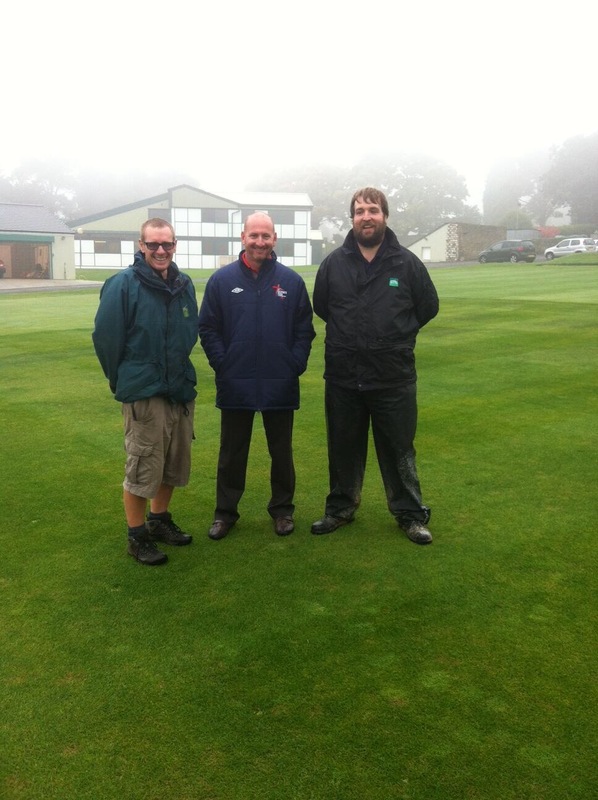 And THANK YOU to all the UK Head Grounds Managers who took time out of their day to talk with me. 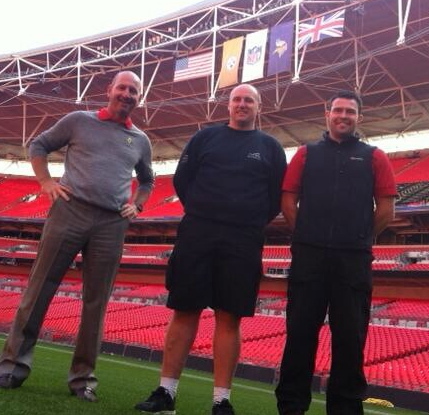 I commented to someone earlier today, the warmth and openness of the UK Grounds Managers is amazing. My last trip over the pond left me thinking the same thing. Steve Jobs, in an award speech to the Academy of Achievement in 1982, stressed the need for different experiences in life to make new connections with reality to feed innovation. The Grounds Managers that spent time with me discussing even the most basic of issues are laying the ground work for innovation, with both themselves and with us in the US. THANK YOU to them for allowing me to be a part of their experiences! Off to Madrid, Spain for the weekend before Porto, Portugal next week for the ESSMA Head Grounds Managers seminar. Cheers to all of you for a fantastic weekend! Day 3: Go, Go, Go! Day 3 in the UK started at St. George’s Park, Home of the English FA. Having hotels in the center of a soccer facility is unique and very convenient for us! As mentioned, the training ground is absolutely fantastic. Many thanks to Mr. Alan Ferguson and Mrs. Carol Ferguson for their hospitality and kindness. With studying reinforcement, in particular Desso, the 1st couple of days of the trip.. it was fitting that the Desso sewing processes was taking place on a field for us to observe. Very interesting and thought-provoking stuff! The 2nd stop of the day was at the Sports Turf Research Institute (STRI). Know for their research and consultancy around the world, visiting STRI was even more interesting than I could have ever expected. Many thanks to Dr. Christian Spring and Mr. Ian Anderson for the tour and the in-depth discussions. 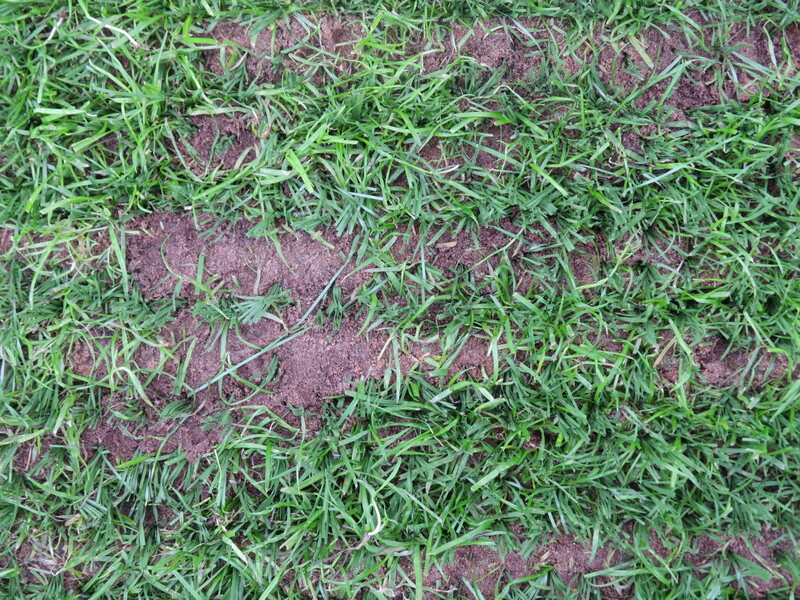 The research trials at STRI were eye-opening on a few different topics related to high traffic grass fields… topics that we will be discussing in the future on this blog. 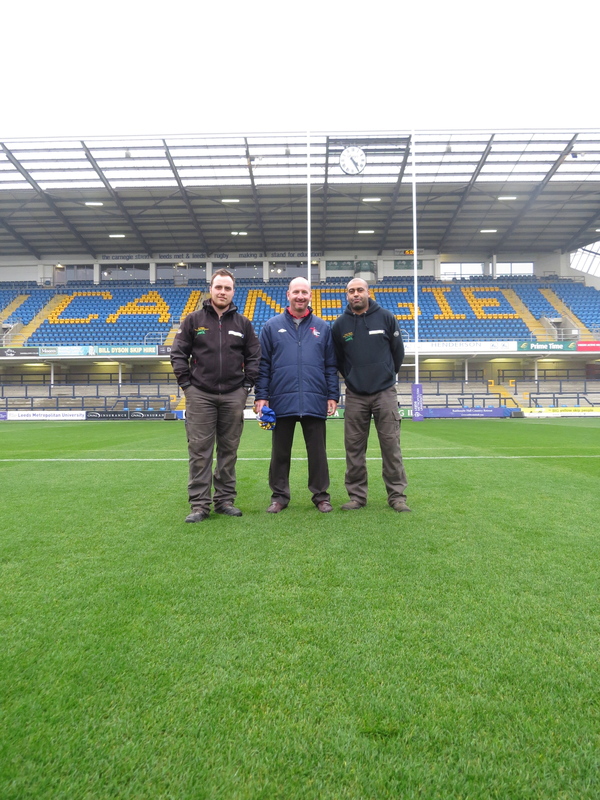 Upon leaving STRI, we next stopped in at Headingley Carnegie Stadium. Home of Leeds Rugby. Unique to anything I’ve ever seen, Leeds Headingley is back to back with the Leeds Cricket Ground, actually sharing a stand with it. Fantastic environment for both sports! Also fantastic is the pitch produced by Mr. Jason Booth & Mr. Ryan Golding. Wow. What great information they shared with me and an even more fascinating story on reconstruction that is a bold elimination of the difference in US and UK groundsmanship. Many thanks to them for their time. Great great stuff… Obviously more to come on that! The day ended with spending time with Mr. Carl Pass, owner of Premier Pitches. Many thanks to him for his time and hospitality! 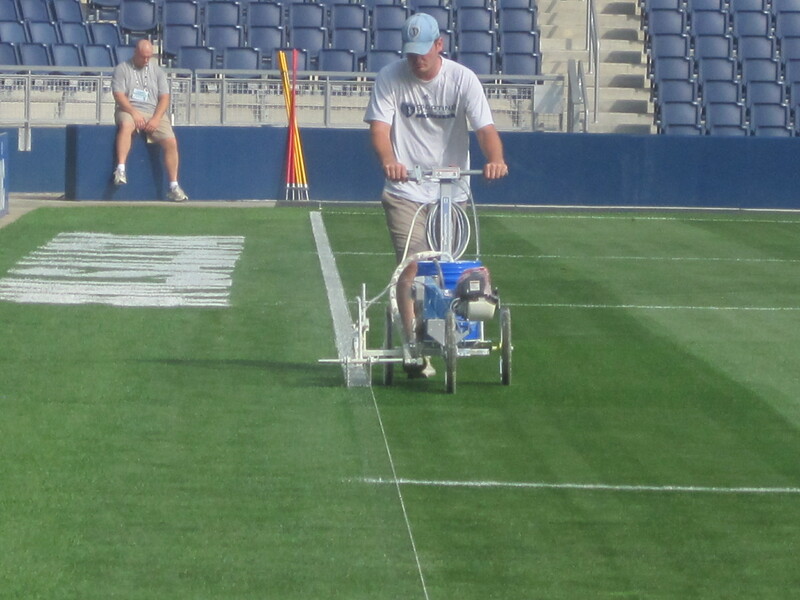 Premier Pitches is one of the most specialized field contractors in the world for field renovation. Mr. Pass’s unique and special Desso renovation tools aided in the birth of many of the renovation techniques discussed on this blog. Many thanks to Mr. Pass for his time and his hospitality. 2 more days left in the UK before heading off to Madrid for the weekend… Day 3 absolutely was eye-opening and has aided in many, many new ideas being created. I am looking forward to more great things to come!! ESSMA & European Exploration: The #Revolution is Growing! With the arrival of fall there are so many fantastic fields around the world being showcased on television and on social media. Kudos to each and every hard-working Grounds Manager out there who is setting the example that grass CAN take more traffic! The grass field #revolution is growing! In the search of new ideas and different perspectives, Saturday I set off on a new trip to Europe to observe and learn from some fantastic Grounds Managers. 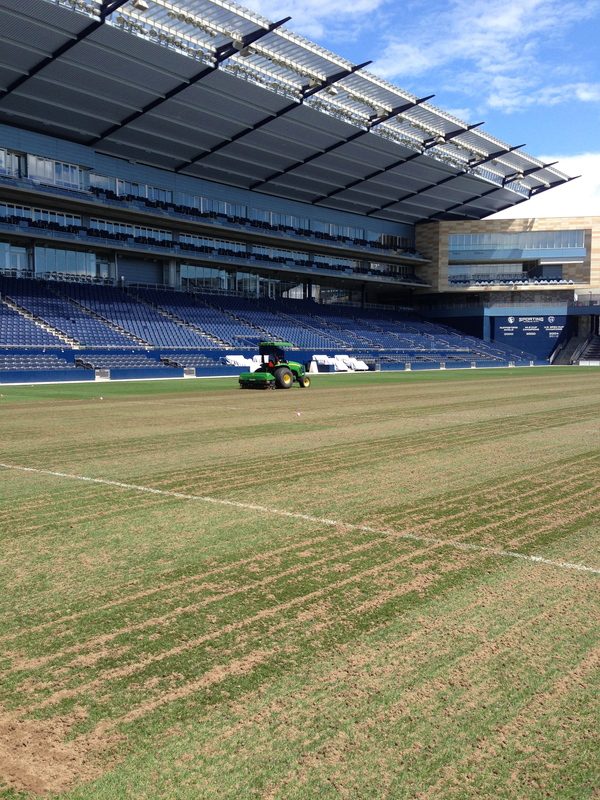 Managers across the big pond are currently maintaining fields under heavy use and preparing for winter play as well. Observations and conversations start in the UK, advance through Spain, and end in Porto, Portugal on Oct. 11. In Portugal I will have the privilege to present the keynote address for the ESSMA Head Grounds Managers Seminar at FC Porto. 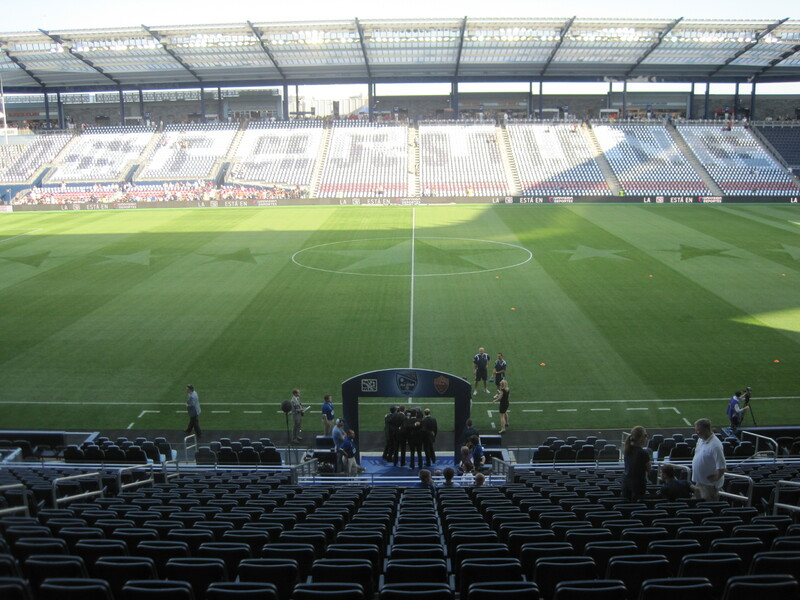 The keynote revolves around the components of the natural grass field #revolution and the possibilities of high traffic natural grass that each of you that read and share around this blog are individually creating every day. Kudos to all of you! Evolution is changing the answer. Revolution is changing the question!! What an honor to be able to take part in the event while representing our fantastic, positive minded team at Maryland SoccerPlex. 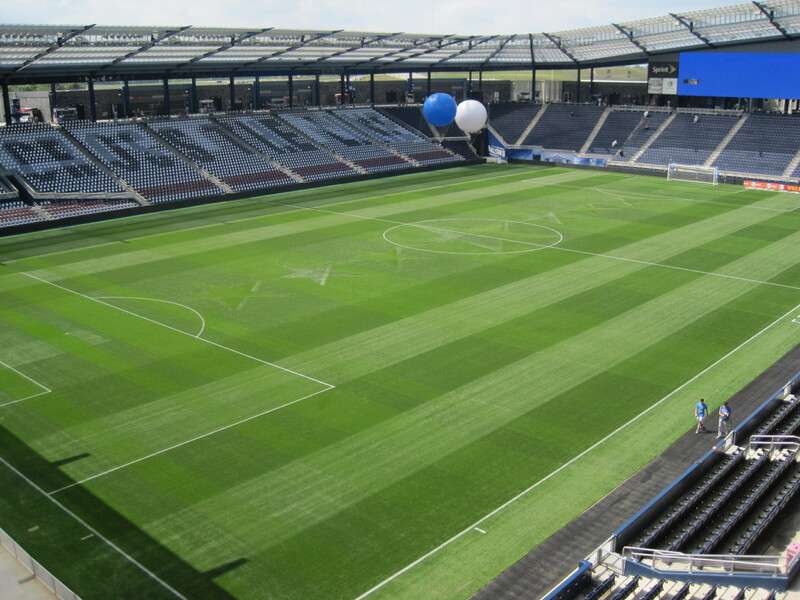 SoccerPlex becomes the 1st American member of ESSMA as part of the event, something we are very, very proud of as well. 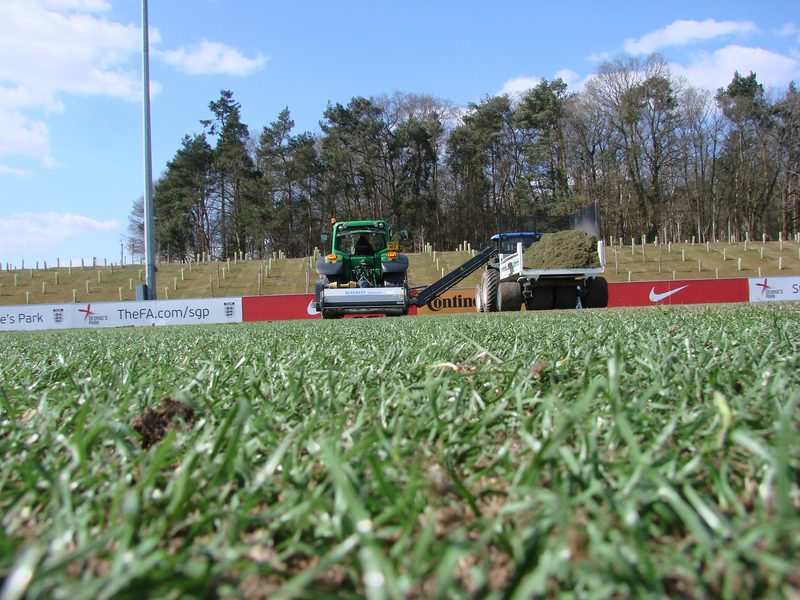 ESSMA, the European Stadium & Safety Management Association, in close cooperation with its field management partners CampeyImants, EVERRIS, DESSO GrassMaster, SGL and TERRAPLAS is presenting its second Head Grounds Managers Seminar . 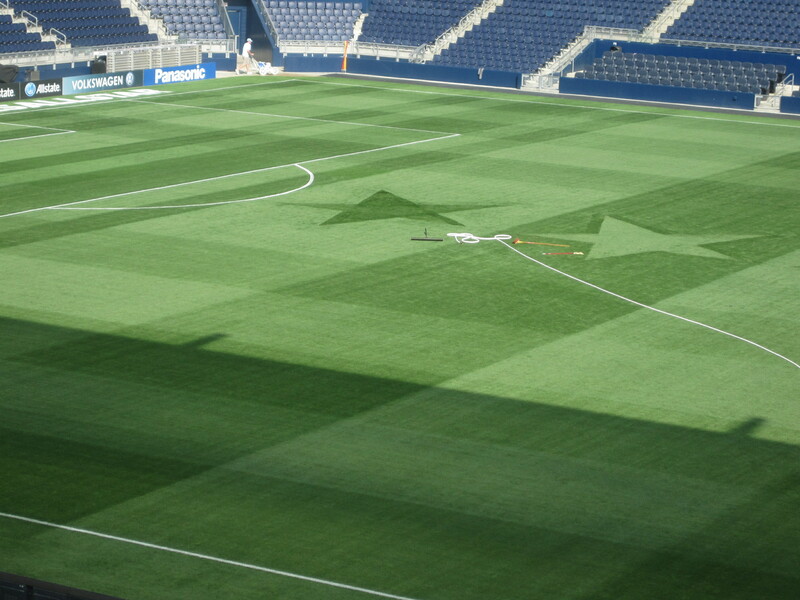 The seminar focuses on the established field management cases of ESSMA, grounds managers sharing their concepts and practical visit to the stadium field and training centre at FC Porto. The 2012 event was held at FC Barcelona. On the education program are Jonathan Calderwood (Paris Saint-Germain), Ricardo Carvalho (FC Porto); Lee Jackson (Manchester City); Sebastian Breuing (VfL Bochum; Bochum, Germany); and Maxim Kobzin (Donbass Arena; Donetsk, Ukraine). There is no doubt that the exchange of ideas and possibilities created at the event will be many! And ultimately, that is the key to the #revolution. 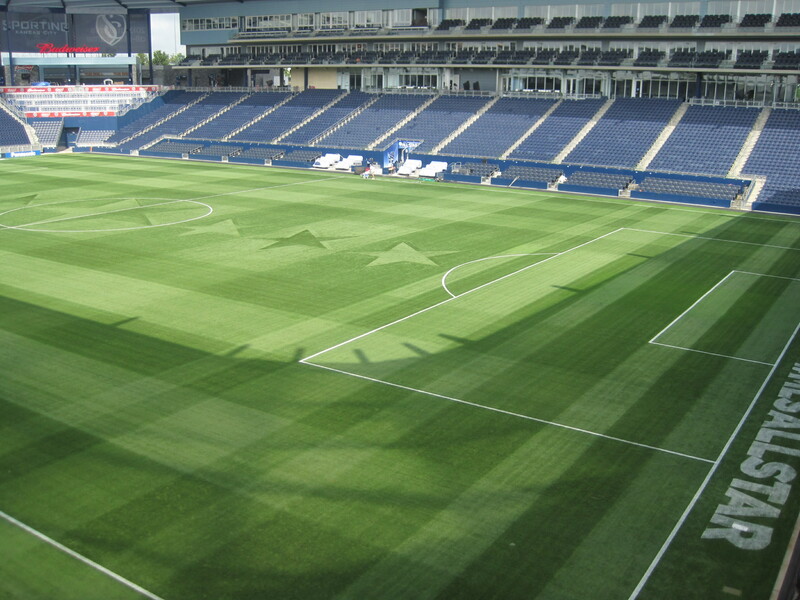 The continual exchange of ideas between managers around the world builds innovation by promoting outside the box thinking to meet the demands and needs of natural grass fields. We have questions and we have answers. Our peers have questions and answers. They have answers to other questions that we might not even realize we need to ask!! Best wishes to a successful end of the week… and CHEERS to the continuing spread of the #revolution!